A few months ago, I went to a craft fair with C because I enjoy taking my child places where there are lots of handmade items for her to potentially break. No, really, it’s great. I remember walking in to the rented room at a Holiday Inn and seeing all the displays of handmade earrings and paper products before me, knowing immediately that we would be purchasing broken Swarovski crystals that very day because I was so desperate to go somewhere other than the park for the 100,000th time. These are the costs that really get you when parenting. College is small compared to the price of 32 dented Pampered Chef chaffing dishes. It was an auspicious day, though, because C behaved herself extremely well – so well, in fact, that I even invited her to McDonalds with me to share my sundae afterward. Part of the reason why we had such a great time that day was because we met a new friend at that craft fair! Schlep is holding on to the ice cream until the appointed time. Amber Ruffin is a fellow North Carolina transplant. Originally from Hawaii, she now lives here and balances being a mom to four children with following her passion: crocheting. Just substitute “Hawaii” with “Tennessee”, “four” with “one”, and “crochet” for “writing”, and she’s basically me. No wonder I love her so much. But I’ve gotta hand it to Wee Cee, because she noticed Amber’s table full of crocheted animals and blankets way before I did and made a beeline over. Kid’s got an eye. The only thing that matched the care and attention to detail that Amber put into her wares was the warmth she showed us when we checked out her handiwork. We walked away that day with a little crocheted corgi that Cee loves to have picnics with. 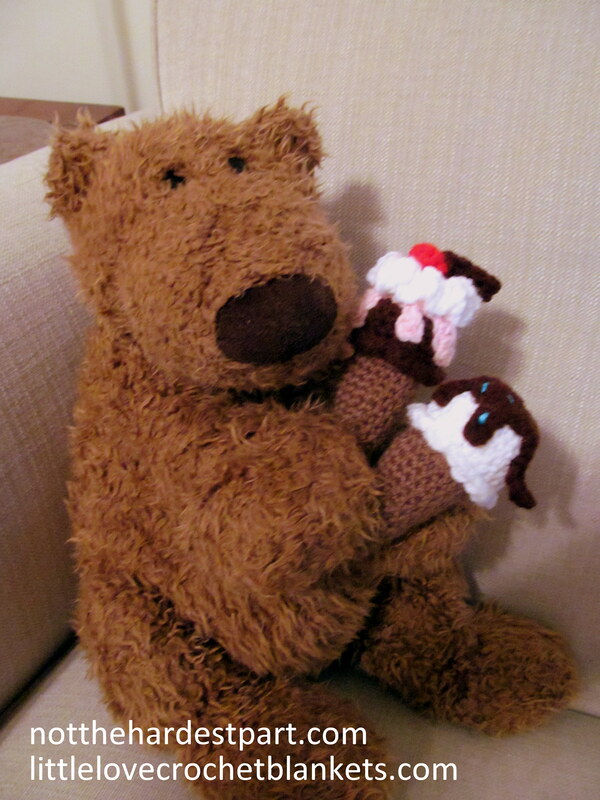 She doesn’t know it yet, but she is also getting two crocheted ice cream cones for Christmas. Little Love Crochet is a family affair. Amber and her mom always joked about starting a crochet business, but it wasn’t until her mother passed away and Amber found herself crocheting as a way to process her grief that her husband suggested she seriously pursue the passion that was such a big part of her relationship with her mom. She did, and named her company after her nicknames for her husband (“Big Love”) and daughter (“Little Love”). You can find her online here. All of her products – which range from toys, home decor, seasonal, blankets, and custom designs – are made with durability in mind. These are toys that are meant to be loved hard. One of my biggest pet peeves as a parent is when C shows her love towards her toys by dumping them in the garbage, and then when I go to launder them, the tag says “surface wash online.” This is not a problem with Little Love items. Amber includes information with each order that tells you exactly how to care for your purchase. I am thrilled to team up with Amber today to host a great holiday giveaway just for you! 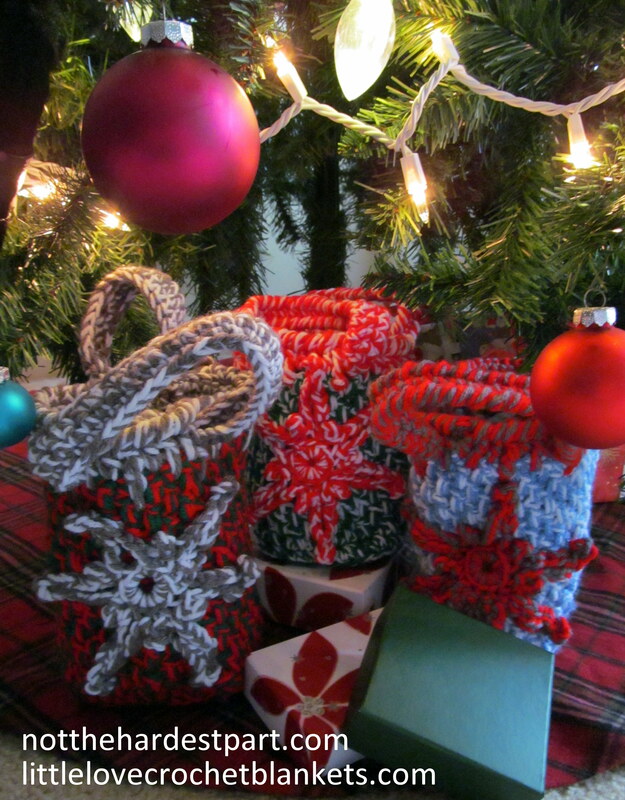 Amber has crocheted three beautiful, soft holiday bags for readers of The Waiting. Inside, you will find some extra little goodies – crocheted Kisses (no chocolate involved but still super sweet), a Christmas bird, or an adorable elephant that totally reminds me of the elephant from the Island of Misfit Toys ;D They make great holiday decorations and keepsakes for you or your own little love. Two of the gift sets will be given away on the blog. However, be sure to “like” me over on Facebook too because the third set will be given away exclusively to Facebook fans. Just find the post that announces the giveaway (it’ll be up this afternoon) and follow the insanely simple instructions to enter. Both giveaways will run through Friday, December 6th at midnight EST. To enter the blog giveaway, click here. Head over to the Facebook page here. adorable awesomeness. speaking as a North Carolina transplant with a daughter who would love that stuff. =D Also, I craft – and do crafting shows (now I house my stuff at the local boutique shops in our downtown area) and I can tell you that I freaking almost lose my mind when adults don’t watch their children as they pick up EVERY SINGLE ITEM in my shop. EVERY ONE. And the adults just watch them do it. I’ve had several things break (because I use miniatures on some of my birdhouses and they are delicate darlings) and the mother’s hurry outta there without a word. lose. my. mind. I tried to fill out that raffleopter thing as best I could. Ugh, that is THE WORST. I really don’t understand the mentality of parents who don’t take ownership of their kids’ behavior. The world is not a playground. The *playground* is a playground. The.End. Did you already tell me that you are in NC? I oddly feel like I knew that. We are in Fayetteville. I am in Charlotte (but wish I wasn’t!). Trying to make the best of it, lately. We were just in Charlotte for Thanksgiving. What cute little ice cream cones! I entered and I’m hoping to win. Containers are the best! In truth, all I want for Christmas is organizational stuff for C to put stuff in. So cute! I wish I could crochet b/c I love these little items. Happy holidays. I know, right?! So adorable! Hope you entered! 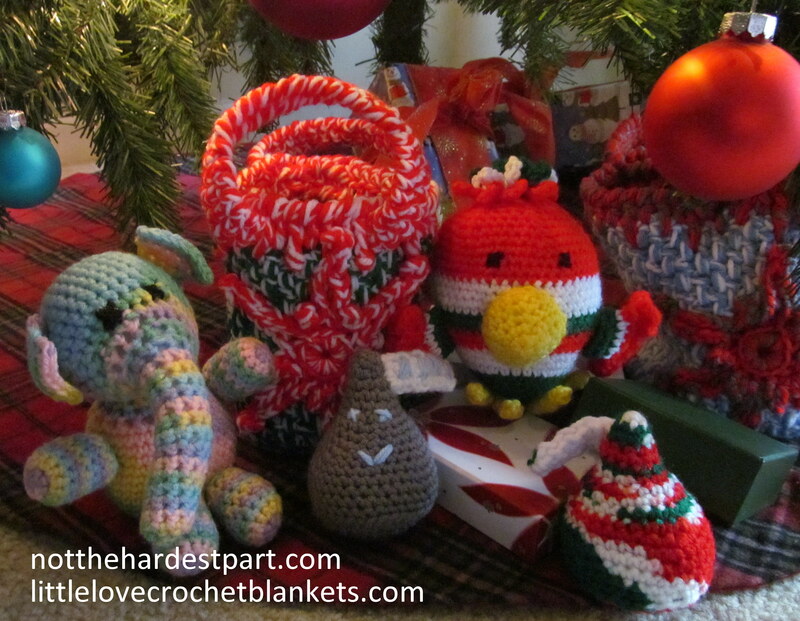 I can’t believe that your friend is able to crochet these adorble things! So cute! I love those little ice cream cones! I love it too! I can’t wait to see who wins it! I personally bought many items from Amber. They are durable and very detail orientated. Through out the processes of my orders, we kept in contact constantly. I love everything that I ordered from her. They make perfect gifts for any and all occasions! Seriously, check her out, you wont be disappointed! Yay! Fingers crossed for you! Thanks, Mariah! You are so helping my holiday shopping! Just bought the little blue bird of happiness for our newest grandbaby! Yay! You are going to love it, Ethel! I am Amber’s Dad so I admit I am biased lol… Any time one of my friends are expecting, Little Love Crochet is my go to for a present. It is unique, well crafted, and a value. Every time I give a baby blanket it is well appreciated. Your daughter is tremendously talented! No bias at all! ;D Thanks, Mike! To my niece and nephew! Okay, I cannot be a hog and enter this contest after winning the Wee C mug and yummy coffee last time! BUT, I simply MUST have one of those elephants since my husband and I dubbed ourselves “misfits” years ago! :) I’ll have to visit her site and buy one to put in his Christmas gift this year – a laz-y-boy chair. Thanks!